Valuing a business that owns real estate presents the business appraiser with a number of conundrums. In this article, the author discusses the concept of a fair investment return and how that may impact the value of the business being sold with the real estate. Location, location, location…the old mantra for real estate still holds true for many owned business facilities. When combined with a facility centric business such as a car wash, golf course, cemetery, gun range, or a funeral home, a prime location can secure client loyalty and future success through generations. Working on many business appraisals that are intricately connected to their facilities reminds me of a Mark Twain quote: “It ain’t what you don’t know that gets you into trouble. It’s what you know for sure that just ain’t so.” Ask any business owner what their business or their facility is worth, and you will need to pull up a chair and put on your boots. In the end, as business appraisers we are looking for “market” rent. This is not to be confused with “fair” rent, which considers the size, condition, and utility of the facility. The “X” factor in determining the market rent specific to the facility is the level of scarcity for comparable facilities that met the size, condition, and usefulness requirements of the business. I do a lot of work with funeral homes and their owners, so let’s use a funeral home business that has common ownership of its facilities as an example. For a funeral business, the facility can make a statement on who they are—sometimes it is an inseparable piece of the business in the client-family’s mind. Countless funeral business owners spend considerable monies on the upkeep of their facilities, furnishings, and vehicles. Some industry advisors seem to think that we should ignore the real estate as a separate income producing asset when valuing a funeral home—simply base the selling price on revenues or some other measure including the value of the real property. However, the real estate value plays a crucial role in the worth of a funeral business, especially in certain situations. Real estate appraisers influence the outcome, of course. Quite often real estate appraisers tend to rely on finding comparable sales (which can be few and far between for funeral homes in any community) and the cost approach (i.e., how much it would cost to re-build the facility, taking into account estimated depreciation and condition). Of the three valuation approaches (Income, Market, and Cost), real estate appraisers rarely examine the market rent as it relates to income produced by the funeral business because there is very little published data on rental rates for funeral home facilities. Whether the funeral business pays rent or not, we still need to have a good idea regarding a market-rent since it directly impacts the business valuation. We find that many owners are clueless as to what market rent should be in their area. Sometimes owners carry their debt service through their real estate—often matching their rent to their principal and interest payments, which may not bear any resemblance to a market-based rent. Business owners should consider market rents in their area, any related debt service, and a fair return on that real estate investment. A few published sources have reported and discussed funeral home rules of thumb on rent in the six to ten percent range of net revenue. Keep in mind, the rent should be realistic, not just some guess or reduced to a generic guideline. Funeral home facilities in Chicago are a lot more expensive than in DesMoines. So how is one to evaluate the efficacy of the rent used or estimate the rent themselves? Listen, and I will share a way. RealtyRates.com publishes the Investor Survey quarterly. It includes cap rates (the real estate kind, not the business valuation kind) for a variety of property types from apartments, golf courses, industrial office buildings (CBD, suburban as well a medical) to special purpose (includes schools and religious properties). Let the real estate appraiser do their thing; we know if not stated, that there must be some imputed level of rent (return) that an investor in any property would expect given the price they would be willing to pay for the property. 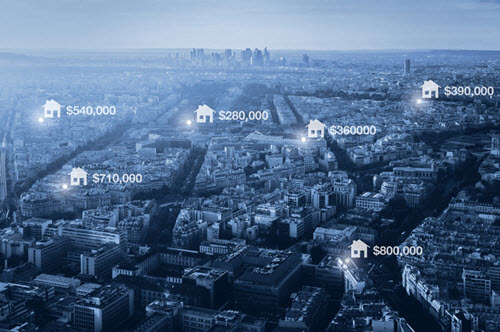 The data provided in the Investor Survey can be used to validate that the rent (estimated or actual) is reasonable or used to develop a reasonable range of rent if none is provided by the real estate appraiser. The importance of real estate for these facility centric businesses has become more visible in our business valuation work. Real estate appraisals, mandatory by lenders in nearly every enterprise value purchase, dictate the worth of the building and property portion of the purchase price. The amount paid beyond the real estate purchase price is then apportioned to remaining assets (tangible and intangible). In the case of funeral homes, increasingly, we find that the real estate value alone for some firms eclipses the estimated value of the operating funeral entity—the funeral business is worth significantly less than the real estate. Wait, how does this happen? This can happen when substantial improvements in the facilities exceed the ability of the business to carry the load (i.e., rent). In the case of a funeral home business, think about the impact the industry changes (increased cremation rates and price pressure from “discount” service providers) have had on revenue and margins—it is no wonder profitability has not kept pace with the facility improvements and the underlying value of the building and property. Let’s look at an example. I.M. King’s funeral home business has net revenue of $1.2 million and operating costs of $1,160,000, including rent of $190,000 (from a real estate appraisal valuing the facility and land at $2,000,000). Considering capital expenditures for regular improvements and vehicle replacement of say $36,000, leaves us with pre-tax cash flow of $4,000; approximately $3,000 after-tax. Assume a WACC of 15% and growth of 3% and the fair market value of the business is about $25,000; making the real estate 80 times more valuable than the operating business. So, you say the rent must be too high, right? Let’s see—the rent is 15.8% of net revenue ($190,000/$1,200,000); indeed over 50% higher than the upper end of rule of thumb mentioned earlier. However, a value of $2 million and rent of $190,000 implies that the real estate cap rate is about 9% (after adjusting for vacancy and other direct costs); that seems to fit into the RealtyRates.com Investor Survey’s First Quarter 2018 report. Average real estate cap rates ranged between 7.97% and 11.31% (suburban office and special purpose respectively); medical office cap rates averaged 9.26% during the same period. So, it seems the rent from a real estate perspective is reasonable. Is the business underperforming or is the real estate overvalued based on its current use? In analyzing our valuation and sales transactions over the past several years, we discovered what we call the Real Estate Paradox. It became clear that when the real estate value exceeded the annual revenue produced by a funeral business, we had a conundrum. For instance, if a funeral business generated just $1,200,000 in revenues but the real estate itself was valued at $2,000,000, the resulting funeral business value almost always fell significantly below the real estate value, nowhere near what the business owner thought it was worth. Breaking the news to an owner that the real estate value has eclipsed their business value is challenging. Can you imagine hearing that your 200-call funeral business, that has been in business “forever”, is worth just $25,000 after allocating $2,000,000 for the real estate? You probably cannot begin to imagine how we feel trying to explain it! As you might suspect, some owners are quite taken by surprise, even dumbfounded with that scenario. There is another factor when considering this paradox. Let’s not forget the return on investment in the real estate. If the funeral home building and property was purchased for $1,000,000 twenty years ago and it is now valued at $2,000,000, including improvements, and collecting market rent—the compounded pre-tax return would have been about 10%. Business owners need to understand that funeral homes (or any business for that matter) and real estate should provide fair investment returns based on the risk and operating profile of the underlying assets. Are any of your clients caught in the real estate paradox? Steven M. Egna, ASA, CBA, CVA, ABAR, CM&AA, is Senior Advisor at Valuation Resource Group, LLC, an East Greenbush, New York valuation, litigation support, transition planning, and M&A Advisory Services firm. Mr. Egna has over 30 years of diversified financial leadership and management experience specializing in transition planning and valuation analysis of all sorts. He brings a practical, hands-on approach to all of his work. Mr. Egna can be contacted at (518) 479-1008 or by e-mail to segna@valuationresource.com.